Mercedes-Benz undoubtedly has all the royal dices in its command, with special contribution from S-Class. 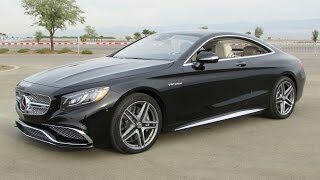 Eliminating its rivals, S-Class Coupe has commendably gained the market competing with BMW and Audi and now with the release of Mercedes-Benz S65 AMG Coupe 2015 it directly steps into competition with Bentley and Rolls Royce. Let us have a closer sneak into the model. Interior of Mercedes-Benz S65 AMG Coupe 2015 is highly luxurious and sportive with all fine materials packed cabin. Designo Exclusive Nappa Leather finished in diamond pattern covers the bucket sports seats with an AMG badge over the backrest. Lower part of dashboard features a massive center console and same accompanied with neighbor dash area and door panels comes dipped in upholstery color; however option to customize is always available. Glory of Nappa leather continues to roof liner, roof grab handles, door pins and white illuminated door sills made from stainless steel. Mercedes-Benz S65 AMG Coupe 2015 brings a perforated leather grip equipped three-spoke steering wheel with a pair of shift paddles. A 12.2 inch high resolution AMG instrument cluster sits behind the steering wheel featuring high-resolution TFT unit while a head-up display shows all vital informations linked to traffic signs, speed limits etc. Exterior of Mercedes-Benz S65 AMG Coupe 2015 features a chrome trim surrounding. The twin-blade radiator grille spreads aggression with the large air intakes integrated in bumper and splitter. Side Skirts gets additional gleam and yes front fenders will steal your attention through the ‘V12 BITURBO’ lettering over them. Moving to the rear end of Mercedes-Benz S65 AMG Coupe 2015 you’ll notice twin-exhaust and a rear diffuser featured in gloss black. In all we found the entire exterior details of Mercedes-Benz S65 AMG Coupe 2015 both elegant and sportive. 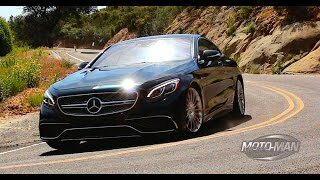 Mercedes-Benz S65 AMG Coupe 2015 gets its power through an AMG 6.0 Liter V12 biturbo engine delivering total output of 621 hp and peak torque of whooping 1000 nm. With this power rolling its rear wheels through an AMG Speedshift Plus 7G-Tronic transmission Mercedes-Benz S65 AMG Coupe 2015 is capable of reaching electronically limited top speed of 186 mph while the 0-60 mph sprint is achieved in 4.0 Seconds only.